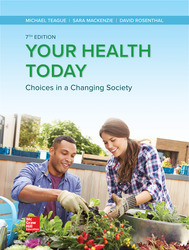 Your Health Today teaches personal health from a perspective of social responsibility. While each of us has a unique set of individual characteristics that shape our health, environmental factors have an impact on our well-being, too. Your Health Today incorporates the individual, interpersonal, and broader social factors that affect our health, acting as a guide for healthy living in college and beyond.